What's next, killer Magic 8 Balls? 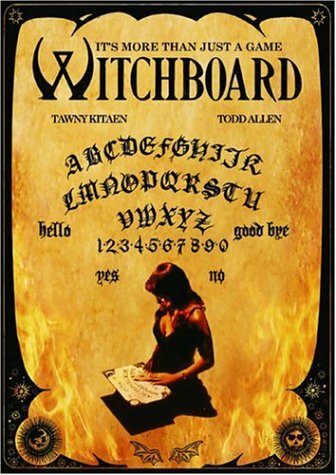 WITCHBOARD perplexes the bad movie reviewer in that for a film that does so much wrong it still manages to tug at the heart strings a little bit—something wholly unexpected from a low-rent horror flick. AMERICAN MARKETER: Yes I like the concept well enough, but we still need a name for it! It takes guts to make horror out of a toy and sometimes it pays off (CHILD’S PLAY ) and sometimes it results in WITCHBOARD. Whereas the “Chucky” doll can be easily animated, there isn’t much threatening about the properties of the Ouija board. After all, it's, well, a piece of cardboard. This is demonstrated in the film’s finale where the Ouija board starts spinning rapidly in midair while the protagonist shoots it with a pistol. Not exactly thrilling. So instead the contrivance here is that the Ouija board is kind of like a radio device to evil spirits which allow them to do two things: move inanimate objects (think THE OMEN ) and possess people (uhm, well, think THE OMEN ). It doesn’t really make sense to me why the evil spirit need possess anyone if it can move random objects in the mortal world, but then I suppose I’m not really studied on these things. … She’ll use the board more and more. Pretty soon all she’ll want to do is use the board; stop going to class etc. A board? Someone needs to introduce this “she” to modern electronics. Oddly enough, what grounds the film is the relationship between the two male leads. At first it appears these characters hate each other, but as more of their backstory is revealed the relationship becomes rather three-dimensional. After one of the characters gets the literal axe (yes, literal), the viewer could be forgiven for feeling some remorse. WITCHBOARD is hardly scary and I wouldn’t suggest anyone except collectors go out of their way to view it, but it’s hardly the worst film you could pop in the DVD player.